Hooray! 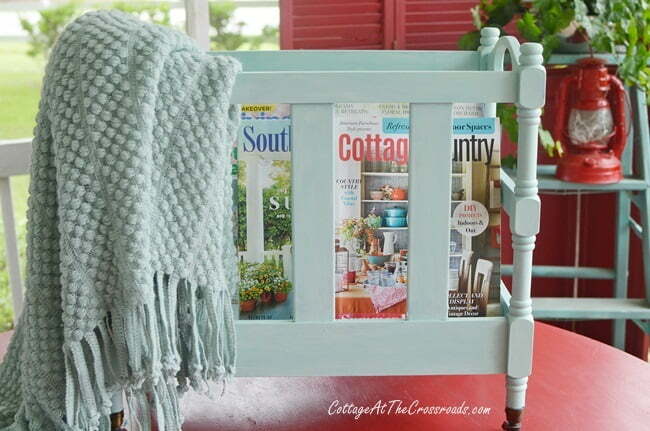 It’s that time of month when the Thrifty Style Team shares its most recent projects, and today I’m showing my upcycled vintage magazine rack that I just painted. It’s so pretty painted this light aqua blue color. It’s filled with summer editions of my favorite magazines. Most members of the Thrifty Style Team find their items to redo in thrift stores but I just walked out to my storage building to find mine. You’ve probably seen magazine racks similar to this, right? Well, I cannot tell you how many times I’ve seen this particular rack because it belonged to my mother. I know for a fact that she has had it since the 1980s so that makes it vintage. She certainly got her money’s worth out of the magazine rack. Last fall when we were having a gas stove installed in her apartment, she had to make some room so the magazine rack had to go. I didn’t realize that it was in such bad shape, but when I went to move it to the storage building, it just about fell apart. But I am not one to just throw something away especially if I think that it can be fixed and painted. So this week I got the magazine rack out of the storage building along with some leftover (affiliate link) Reclaim paint from another project. 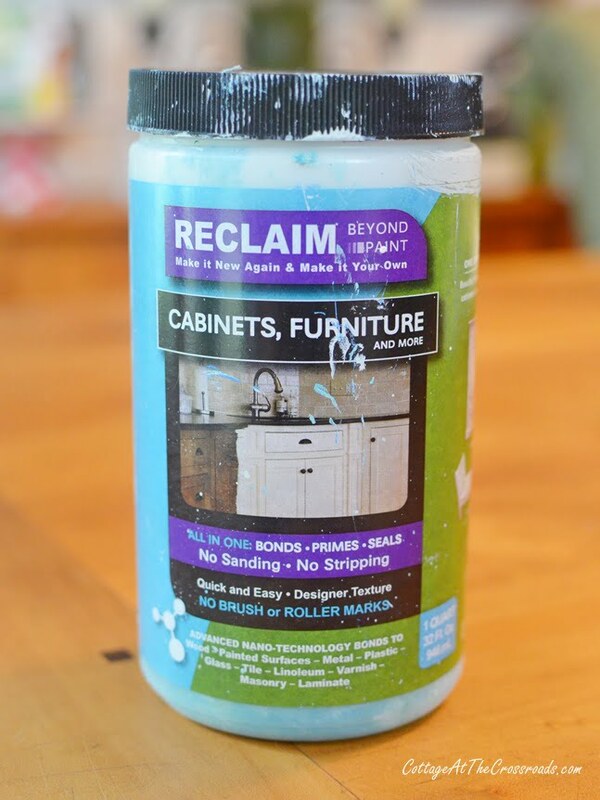 Reclaim paint will cover dark stained furniture without prep work. 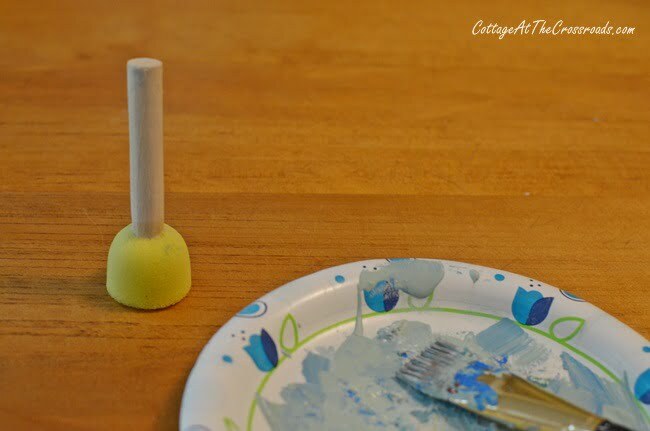 After cleaning the magazine rack and putting the pieces back together, I got out this pouncer sponge brush along with a craft brush and commenced to painting. Using the pouncer brush to apply the first coat of paint was a genius tip I picked up from Lisa at The Purple Hydrangea. It’s a quick way to spread some color on a project in a hurry. I need to explain that by using this Reclaim paint (which adhers easily to prefinished furniture) I didn’t have to sand or strip off the previous finish. Nope, I just smeared on the first coat very quickly. I also need to explain that the paint I was using was a very pale blue so I just dropped in some darker blue acrylic paint. I don’t really bother thoroughly mixing it. In the above photo, you can see the mix of colors on the piece. I don’t even try to blend it much while I’m painting because it gives a more layered look to it. 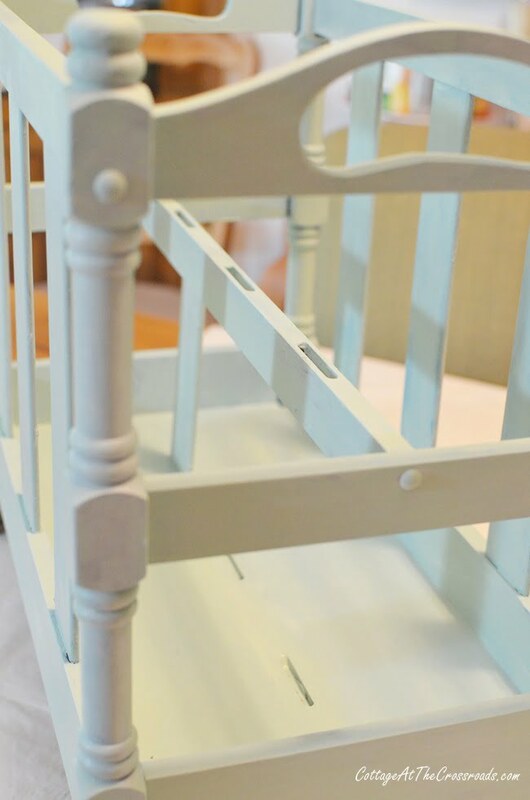 If you want to experiment with painting furniture, starting with a small project like this is perfect. It all blends in by the final coat. I was wondering why the magazine rack was coming apart and discovered that someone had put the middle piece in upside down! But I just left it that way because it has lasted for over thirty years or more in this position! 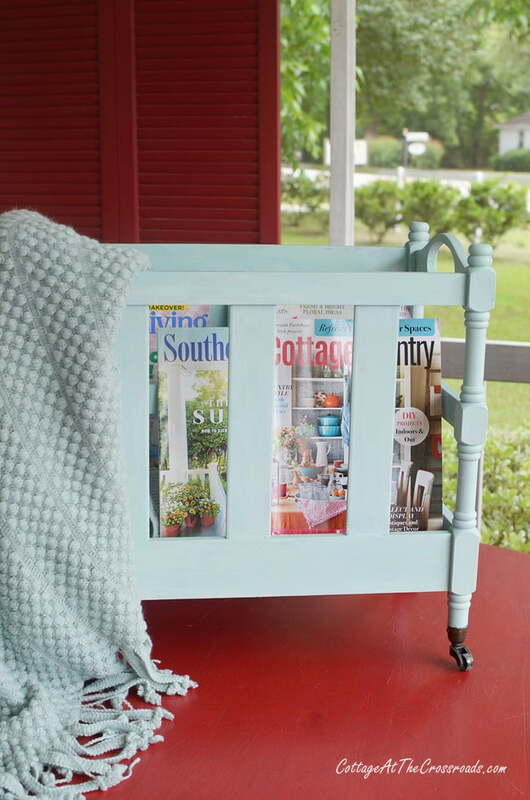 Within a few hours, I had an upcycled vintage magazine rack! Now it looks all summery especially with a light throw tucked into it for chilly air-conditioned rooms. The light aqua blue color is my absolute favorite. I have slowly been adding more of that color into our home. Here’s a side view of the painted magazine rack. It just goes to show how a little bit of paint can upcycle something once destined for the trash. 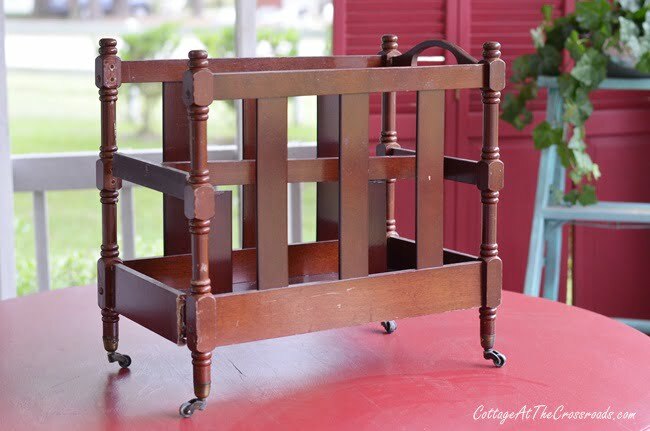 If you happen to run across one of these wooden magazine racks at a thrift store or a garage sale, be sure to snap it up. 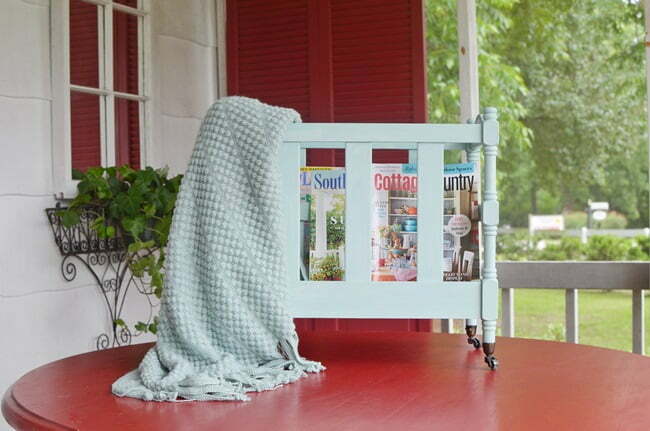 There’s always a place for an upcycled vintage magazine rack in your home, I’m sure! 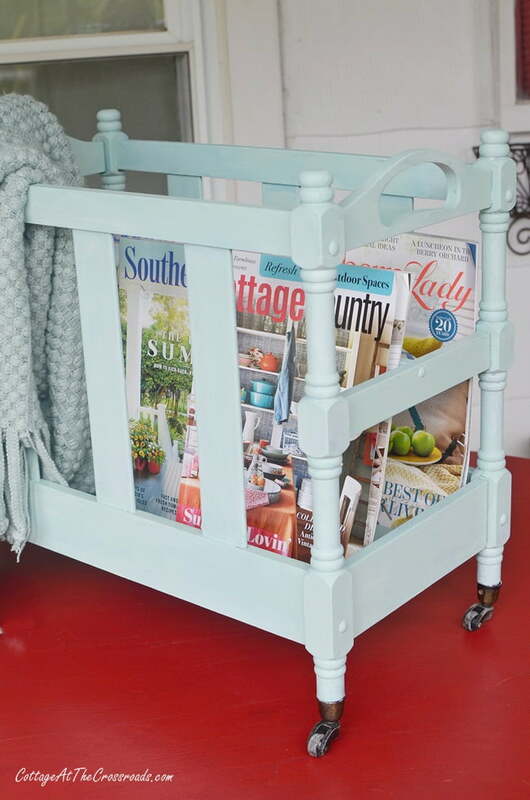 Now that I’ve put down my paintbrush, I can peruse the magazines inside my upcycled vintage magazine rack! Now it’s time to see what the other members of the Thrifty Style Team have for you today. Jane, You always come up with the BEST ideas. I haven’t ever heard of Reclaim paint. I am excited to check it out. Very cute, Jane! 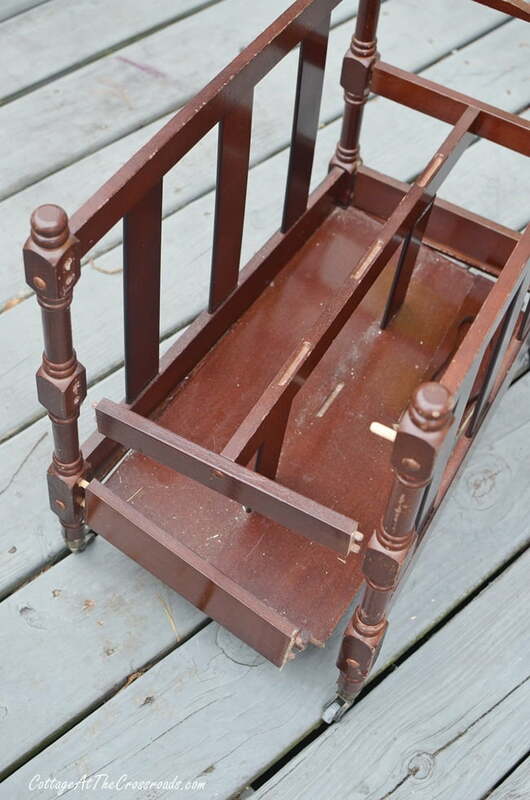 I love the fancy little roller feet on your mom’s magazine rack! Gorgeous relove. Love the color too. Bright and cheerful. Super cute. Jane, what a great way to dress that magazine rack up. your mama would be happy! What a gorgeous upcycle, Jane! That color is gorgeous, too! Where did you get the reclamation paint you used first? You can find the Reclaim paint on Amazon. I added my affiliate link underneath the photo of the paint. Thank you for the inspiration! 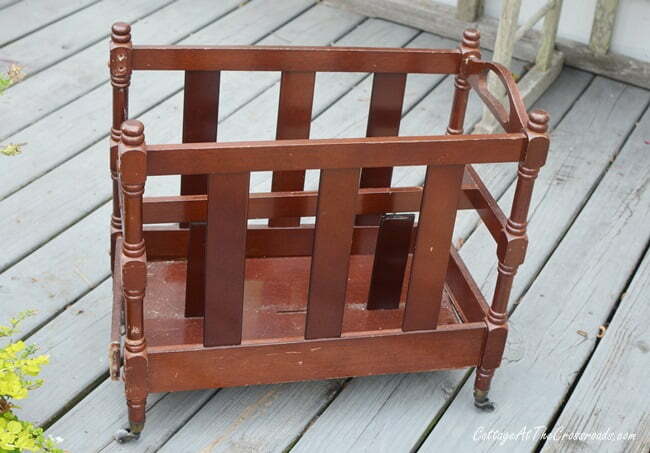 I picked up 2 old magazine racks a while back, time to get the paint and brush and have some creative fun! The color is perfection, Jane, and those little wheels!!!! 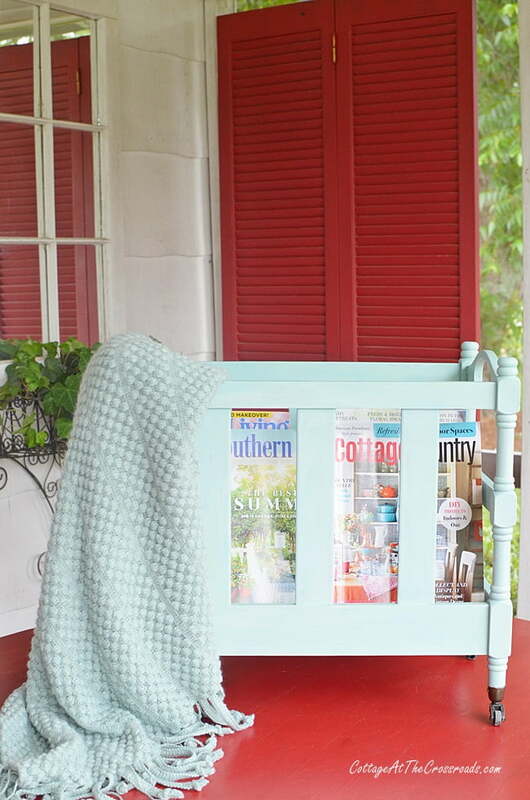 I have never seen a magazine rack with those but I think I need to start looking for one. What a lovely makeover. This is such a sweet piece! I love the castors… and that pale aqua is just perfect! What is the name of the color you used ,please? The Reclaim paint came in a very pale blue called Versailles which they don’t offer on Amazon. I went back into the post and put an affiliate link to the paint in case anyone is interested in purchasing some. I don’t know if they discontinued that shade or not. 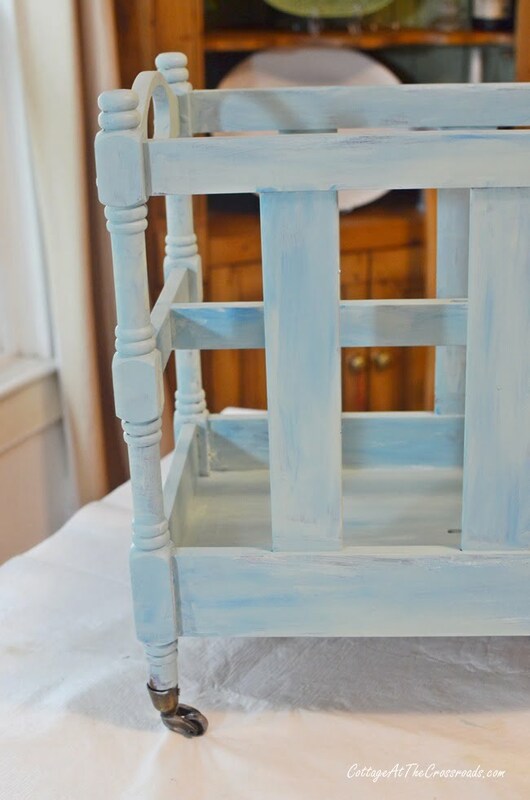 It really was such a pale blue that I remember adding some blue acrylic to it to give it some more color when I painted a night stand with it. Anyway, here’s what I suggest you can do. Take any paint that is designed to adhere easily (such as Reclaim or chalk paint) and purchase it in white. Then add acrylic paint to it to get your desired color. 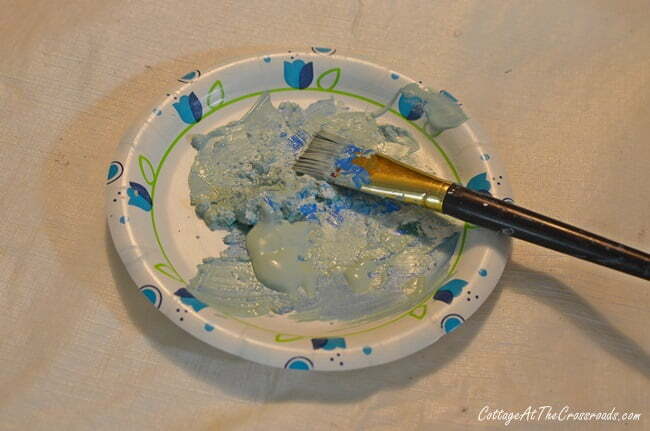 I have used sample pots of paint from Lowe’s as well as craft paint, and I’ve even used a tube of artist acrylic paint! 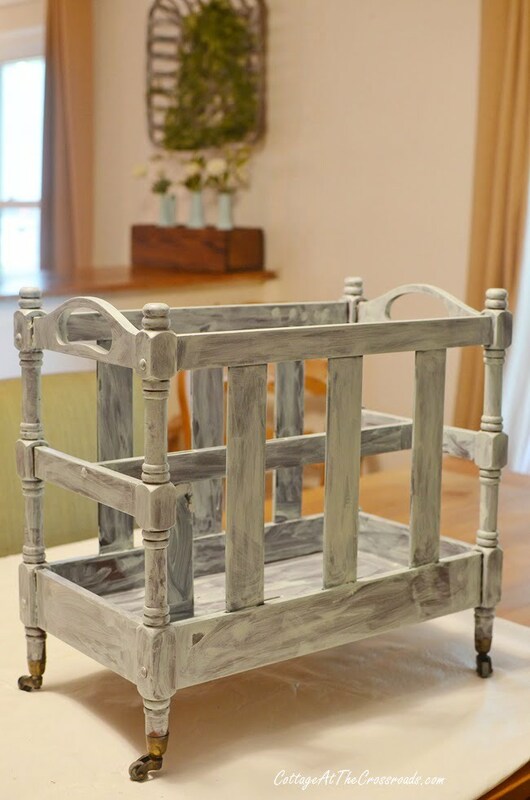 Of course, you can find chalk paint in almost any color you desire! It looks wonderful. I almost bought one the other day at Goodwill. I may head back to see if they still have it. You have inspired me! I love the way this turned out! Great way to update a keepsake. Love the magazine rack Jane!…what an appropriate post for me today as I spent hours yesterday going through boxes and boxes of old magazines that I have held on to for so many years….it was time to let go..but it was hard…I still kept some of my favs and premiere issues…I have been a shelter/decorating magazine lover since a teenager…preferred them to the “Seventeen” magazine…remember those? 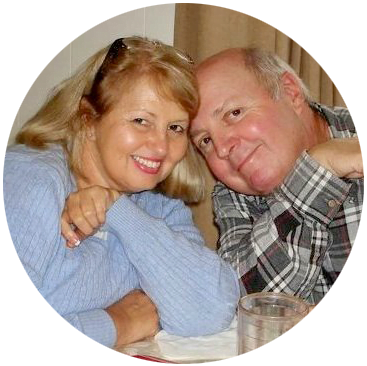 Have a great day and enjoy your mother’s transformed magazine rack…I know she would have been happy to see you give it new life!